Magnetic resonance imaging (MRI)-guided prostate biopsy has been shown in a number of studies to improve the detection of clinically significant prostate cancer (csPCa). In this study, which is also the first such reported study from Southeast Asia, we aim to review our initial experience with the UroNav system (In Vivo Corp./Philips) for MRI-transrectal ultrasound fusion prostate biopsies. Consecutive patients were registered into a prospective institutional review board–approved database (DSRB 2015/01252) assessing MRI-targeted prostate biopsy in our institution. We reviewed patients who underwent biopsy from 1 May 2016 to 31 March 2017. Inclusion criteria for our study were patients with at least one Prostate Imaging – Reporting and Data System (PIRADS) 3 or higher lesion on multi-parametric (mp) MRI and who underwent both targeted and systematic prostatic biopsies in the same sitting. The primary objective was to compare targeted and systematic biopsy approaches for the detection of csPCa (which we defined as any Gleason score ≥ 7 cancer). 79 patients were included in the study. 60 patients (75.9%) had a previous negative prostatic biopsy. The number of patients with at least one PIRADS 3, 4 or 5 lesion were 45 (57.0%), 25 (31.6%) and 9 (11.4%) respectively. The detection rates for csPCa for patients with PIRADS 3, 4 or 5 lesions were 8.9%, 40.0% and 77.8% respectively. In comparison, 17.7% of patients had csPCa detected on systematic biopsy. 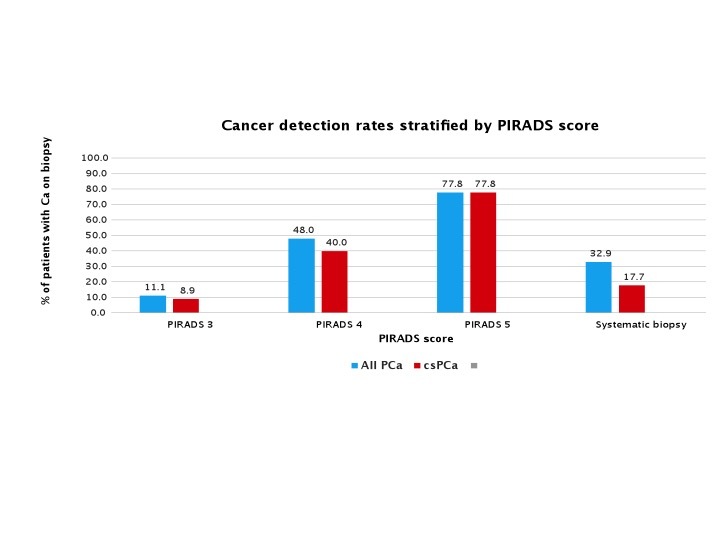 Targeted biopsies demonstrated higher sensitivity for the detection of csPCa compared to systematic biopsies (87.5% versus 58.3% respectively, p<0.01). If only targeted biopsy was performed, 3 (12.5%) cases of csPCa would have been missed. On the other hand, systematic biopsy missed 10 (41.7%) cases of csPCa. 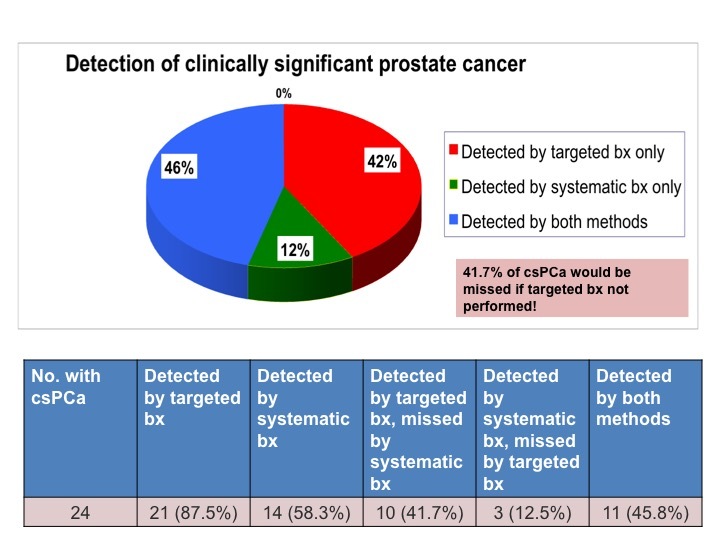 Targeted prostate biopsies demonstrated higher sensitivity for the detection of csPCa compared to systematic biopsies, with a significant proportion (41.7%) of csPCa detected on targeted biopsies only. 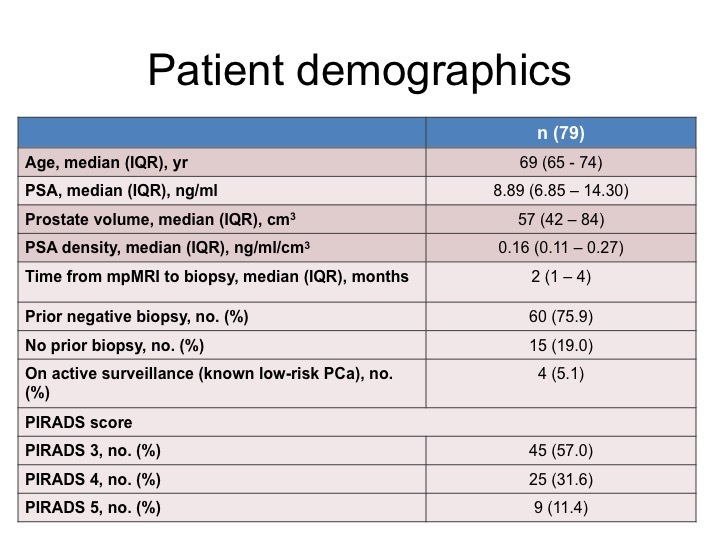 However, systematic biopsies should not be omitted as a proportion (12.5%) of csPCa may otherwise be missed with a targeted biopsy-only approach.